Last weekend, my sister was visiting me in Singapore from Australia, en route to Canada for a couple of months. I asked her to bring me the McDonald's Australia promotional burgers that were available at the time, this review will cover The Argentina, the double-pattied beef burger which was only available from 11 June - 25 June 2014. 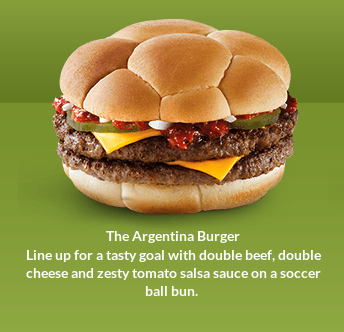 The Argentina was the only double-pattied burger of the 4 promo burgers offered for the World Cup, and it also happens to be the most expensive, at $6.95AUD for just the burger. The "reason" for that, is that Argentina are double World Cup winners, a pretty weak excuse if you ask me. It was supposed to be topped with 'Argentinian' Salsa, pickles and onions. I don't like pickles, and when I noticed my burger not having pickles, I asked my sister (who is usually pretty clueless), if she actually remembered I don't like pickles...she said no, which made me take a closer look at my burger. Now, originally, I thought they had just included the veg from The Brazil on this burger, the loss of onion is not the biggest issue for me, but since the biggest difference between these promotional burgers are the sauces. I looked up the ingredient list on the official website, and both burgers had were tomato and chilli based sauces, but the sauce that was on my Argentinian burger was much thinner and weaker tasting, it also was clearly a "sauce" and not "salsa". I also inspected both official photos of the burgers, and it does look like the thinner sauce was supposed be on The Brazil. Both beef patties on this burger were very thick, so the sheer amount of beef in the sandwich (not to mention the 2 slices of cheese) overpowered any sauce that was on there. The lettuce, cabbage and carrot mix was a nice change of pace, and that was the only redeeming topping on this burger. I've also had the football bun once prior, on the Habanero Beef Burger from Malaysia, and when I had it that time, I felt it was very floury, and the taste of the bun distracted from the rest of the burger. This bun, had no taste at all, but that is possibly because I microwaved the burger before I ate it. Now, this burger was not supposed to have mayo on it, and normally I would find that a good thing, but at least the mayo took a way from the overpowering beef. I've thought about it for a while now, it's pretty clear this was not the correct toppings for this burger, and I'm a bit hesitant to give it a proper rating. Essentially, the only thing that was right about this burger was that it had 2 patties. If I had to rate it how I ate it, it would be a 2/5, but you'll find out in the upcoming review of The Brazil, the salsa on that burger was a big influence on the taste. I had 3 burgers that day, and this was clearly the worst tasting, and my least favourite. Sadly, this wasn't the only problem I had with this order... My sister said she was very clear when she ordered, she asked for The England Pie, the World Cup promotional pie which she was supposed to bring me. 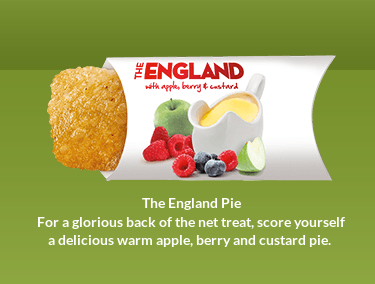 Which sounded very good, Apple, Berry and Custard all in a single pie. Sure it was fried rather than baked, but I was still interested in trying it. The McDonald's she ordered it at was out of Brazil and Australia burger boxes (that's why my first photo of this review shows 3 Argentina Boxes) so when I saw the box for an Apple Pie in the bag, I wasn't all that worried. I took my photos in preparation to eat the pie. Put it into the microwave. The receipt did state "1 Hot Apple Pie". Whoops?